The Vivo V9 is definitely a looker with its sleek bezel less screen with a medium-sized notch at the top which blends in. It is super slim and easy to hold. The efficient mid-range processor and large RAM would mean day-to-day activity and mid-range games will work flawlessly, and switching between apps shouldn't be a problem either. Both front and rear cameras take good pictures with portrait mode. Though for the price going with micro-USB instead of USB type-C is a downer, the battery could have been bigger to compliment such a large display. The Vivo V9 flaunts a 6.3-inch Full HD+ IPS LCD display with a crisp 400 PPI pixel density and 1080 x 2280 pixels screen resolution. It has an impressive 19:9 aspect ratio and 84.91% screen-to-body ratio. On the camera department it has 13MP + 2MP dual rear cameras with autofocus, f2.2 aperture and LED flash. Other noteworthy features are HDR, face detection, touch to focus and more. The front shooter is a 12MP camera with f2.0 aperture. The phone boasts an efficient 64-bit octa-core Snapdragon 660 MSM8956 SoC. On the graphics department, itÃ¢ÂÂs powered by Adreno 512. It has a fingerprint sensor at the rear. It holds 6GB of RAM. On the battery department the phone packs a 3,260mAh Li-ion non-removable battery, which should last about a day with casual usage. It a dual nano-sim phone with dedicated slots and supports wide range of spectrums of 4G including VoLTE so most networks will work. It has 802.11, b/g/n/n 5GHz WIFI with Bluetooth v4.2. On the location department it supports A-GPS and Glonass. The USB port is a micro-USB 2.0 with mass storage and OTG support. It has 64GB of internal storage with up to 256GB expandability with dedicated SD slot. 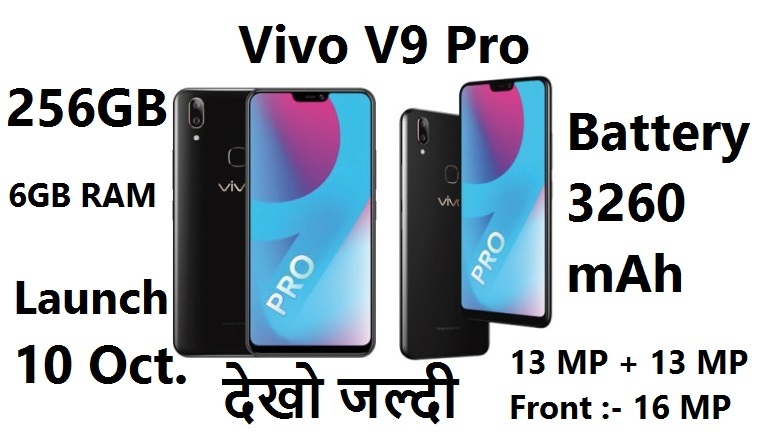 Vivo V9 Pro price in India is expected to be Rs. 17,990. 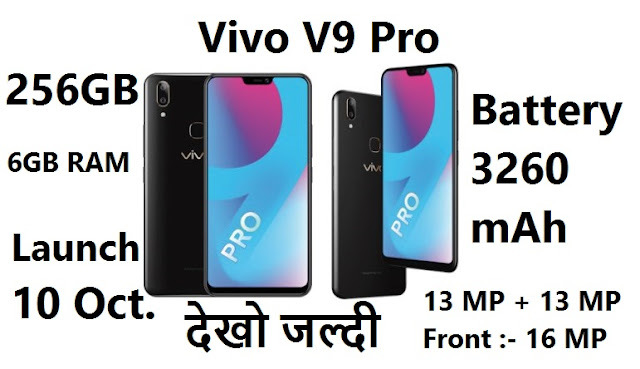 Vivo V9 Pro Expected to be launched on Oct 10, 2018. This is 6 GB RAM / 64 GB internal storage variant of Vivo which is expected to available in Black colour.